Where to Buy Contrac All Weather Blox, Contrac All Weather Blox Rodenticide - 18 Lb Pail - $89.95 for Sale with Fast Free Shipping! Contrac All Weather Blox Rodenticide - 18 Lb Pail is a single-feeding anticoagulant rodenticide containing bromadiolone. 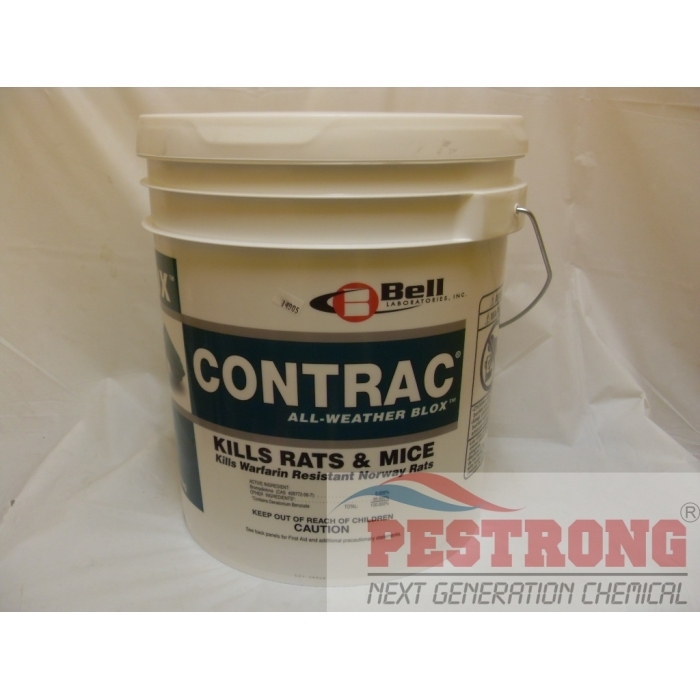 Unsurpassed in rodent acceptance and control, this is an excellent clean-out and maintenance bait to control mice and rats, including warfarin-resistant norway rats. It is specially formulated with an optimal blend of food-grade ingredients and a small amount of paraffin. The result is a highly palatable, yet weatherable, bait that works well in wet and dry conditions. Bait acceptance with this, is superior due to its highly palatable formulation. Plus, manufactured with Bell's extrusion process, It has multiple edges that appeal to a rodent's desire to gnaw. Rodents can consume a lethal dose in just one feeding. Bait shyness is not a problem with this because mortality occurs a few days after bait is consumed. It is also less toxic to non-target animals, in both primary and secondary poisoning situations, than other single-feeding anticoagulants. The antidote, Vitamin K1, is readily available and there is a time factor for treatment. For ease of use, a hole in the center of the Blox lets technicians place it on bait securing rods in tamper-resistant bait stations, or nail or wire the Blox in place. Works great!! Sometimes it disappears from bait stations very quickly with high infestation (especially Spring and early Summer). So keep bait stations loaded, and soon you will be rodent-free. Economical 18-pound pail last "forever". I have had this still be very effective 3-years after purchase. Great rodenticide I have known! High recommended. This product truly does the job. I use it for rodents..... it is amazing.... put these blocks out and no more rodents! No.1 rodent bait. It works great than other bait. I recommend to use this!